Facebook users have seen thousands of bland ads. Here’s a formula for connecting with your audience at a high rate. If you are a daily Facebook user, you probably know that feeling when a crappy advertisement invades your feed. Actually, you may NOT know the feeling because your brain automatically ignores the ad and moves on to the next piece of content. After all, these advertisers are grappling for your attention every second of the day (or so it seems)! But, if you are also a digital marketer, you have probably also heard the rumor: Early adopters of Facebook Ads are achieving OUTRAGEOUS ROI on their campaigns! They are getting 10-100x returns on their ad dollars. The Facebook Ads product has undergone major improvements over the last three years, and it now has incredible targetting capabilities. At the same time, the average clickthrough rate hovers around 1%, according to WordStream. This means 99% of people do not click on the average ad. How can both of these things be true? To find out, I interviewed Rick Kranz, the President of OverGo Studio. OverGo is a 7-year-old inbound marketing agency that works with luxury consumer brands. They have spent hundreds of thousands of dollars on Facebook Ads and with one client, they generate over $1,000,000 of revenue per year with just $7,000 of ad spend! Copy and videos that are obvious advertisements: Facebook users have a keen eye for content that feels ‘unnatural’. Rick explains how to create content that feels like a natural interaction rather than a pitch. Ignoring the 5 stages of customer awareness: Marketers tend to develop content assuming that the viewer is actively seeking a solution to their problem. Rick shows how to cover all levels of awareness. Here are the frameworks and creative processes he uses to overcome these common challenges. Imagine that you are a professional guitar teacher, and you attend a cocktail party. Of course, you want to generate more business for yourself, but you also don’t want to seem sales-y when you meet new people. You walk around the party, meeting the other attendees. Eventually, you meet a person that is a casual guitar player, and could eventually be a student for you. This is analogous to serving a Facebook Ad to a cold audience of people interested in guitars. Being ‘interested in guitar’ can mean a wide variety of things, and includes millions of people in the United States. In Rick’s experience, most marketers would make an offer of a free, introductory guitar lesson in this case. Here is the problem with that approach: It smells like an ad. That person is not stupid. He or she knows that your eventual goal is to add another paying student to your schedule. Although you may feel like this is a generous offer, in reality, it is not an empathetic offer. You actually know very little about this new person’s situation. And they know a single guitar lesson will not improve their life very much. Rick would instead recommend that you create a free offer around one key technique or trick that almost any novice guitar player would want to know. The one technique or trick is different than a free lesson because it is individually valuable. And, it provides a clue that you understand their personal situation. A free lesson is a blanket offer- it can be given to any person at any skill level. But, by creating a lesson around an intermediate technique or trick, you prove that you are committed to helping them on their terms. If this was a Facebook ad, you could create a 2-minute video that introduces this new technique to a cold audience. This actually helps you qualify your audience! If a Facebook user watches 50% of the video, you know that they are your target persona, and you can serve a follow-up ad accordingly. Instead, create an offer that focuses on the actual needs of the Facebook user in his or her own words. You can find this information many ways, like talking to customers, looking at Amazon reviews or digging into your own customer feedback. You can measure your success by using Facebook’s Relevance Score, a measurement of viewer’s satisfaction with your ad. Although the Custom Audiences tool in Facebook Ads allows you to target users very granularly, there is still one major issue: You have no idea whether these users are familiar with your brand or if they even experience the problem that you solve! If you are fortunate enough to have tens of thousands of users coming to your domain, you can target ads based on the predicted level of awareness. For example, if a visitor from your site has seen the ‘/pricing’ page, you can assume that they are serious about buying. If you use the Facebook retargeting pixel on your site, you can serve an ad to those visitors when they visit Facebook in the same browser. But, most marketers do not have that volume of visitors. So, they must make do with audiences based on interests and demographics. Most marketers choose to only target one stage at a time. But, according to the popular advertising framework created by Eugene Schwartz in his book Breakthrough Advertising, there are actually 5 levels of customer awareness! And if you only target one level of awareness, you ignore 80% of the market. Problem-Aware: Your prospect senses he has a problem, but doesn’t know there’s a solution. Solution-Aware: Your prospect knows the result he wants, but not that your product provides it. Product-Aware: Your prospect knows what you sell, but isn’t sure it’s right for him. There is no perfect way to solve this. You do NOT want to create ads for multiple levels of awareness, and then test them to determine which one seems to ‘represent the market’. The framework has shown over and over again that there is no bucket that is particularly dominant. Instead, if you are creating text ads, you should create 5 different ad sets, so that Facebook Ads does not force them to compete against each other for impressions. Then, design an ad for each level of awareness. That way, a Facebook user may see one ad, and quickly determine that your brand is just noise. But, they may see another ad that speaks directly to their level of awareness and engage with it! There is no way to create an effective ad for all 5 levels at the same time. Even better, you can try an ad with a 2-minute video. That way, you can touch on all 5 levels of awareness at the same time. You can begin the video by explaining the problem, move into solutions and address common objections. Let’s use an example. According to HubSpot research, 40% of salespeople still use spreadsheets and email rather than a CRM. And, 22% of salespeople still do not even know what a CRM is! Think about how much variability you can find in the CRM market, which is relatively mature. On one end of the spectrum, you have unaware sales leaders. On the other end, you have veteran sales managers that have probably used 3-5 CRMs over the course of their career. It would be CRAZY to create one ad for all these sales managers! How would you pitch your product? One group would be terrified of new technology, while any member of the most-aware group would be looking for specific features to convince them to rip out their existing CRM. Create multiple versions of the ad, and then split-test the copy and default image on the video. Nobody gets it right on the first time. As Facebook Ads becomes a more popular channel… well, you know what happens next. Prices will go up, and marketers will begin shamelessly copying each other. The best way to set yourself apart from the rest of the pack is to show how well you understand the wants of your customers. Since you only have a second of the Facebook user’s attention, make sure your copy and imagery reflect your empathy for the customer. Customers can detect empty words because that is their standard expectation from years of exposure to advertising. Rick measures his overall effectiveness via cost per conversion- either cost per lead or cost per customer. Although that is a great metric to report to a boss or client, you probably need to monitor some intermediate metrics that will determine your cost per conversion. 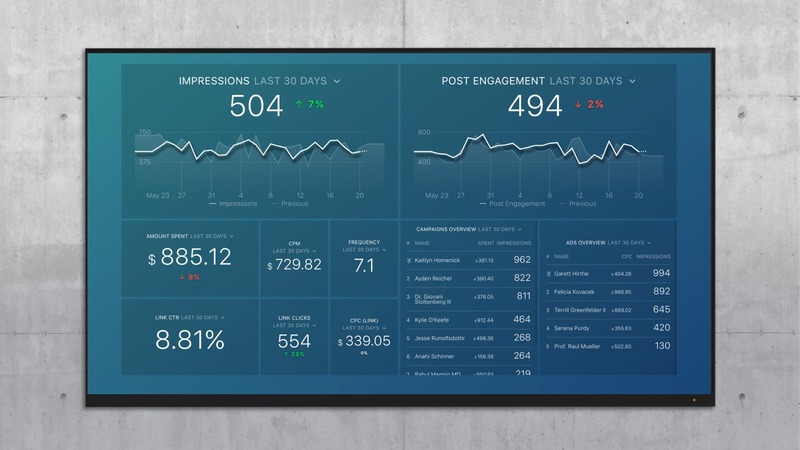 The Facebook Ads Campaign Performance dashboard gives you a full overview of your account. It shows your most successful campaigns and ads and tracks overall spend, clicks and CPC. 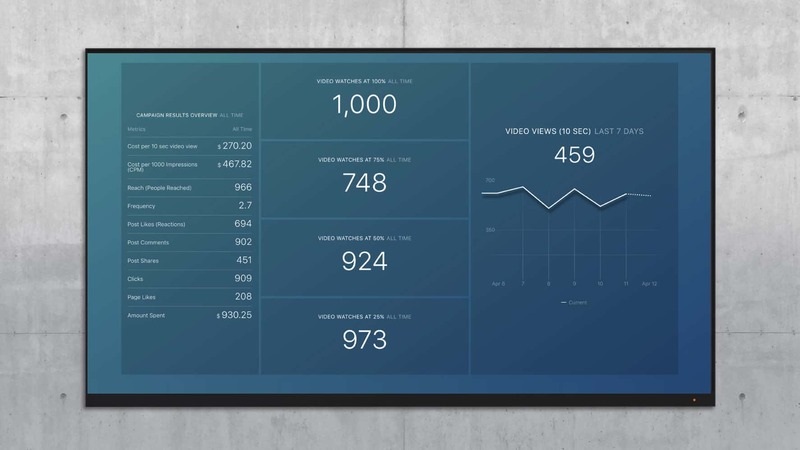 The Facebook Video Completion dashboard zooms in on video ads, and shows whether you are moving your viewers through the different levels of awareness. You can determine whether you are efficiently introducing your Custom Audience to your brand. Don’t pitch your product or solution to an audience not ready to buy it. Measure which ads work best with which audiences. Not only will this approach get you a better ROI out of the gate, it’ll also help you refine your conversion rates over time.